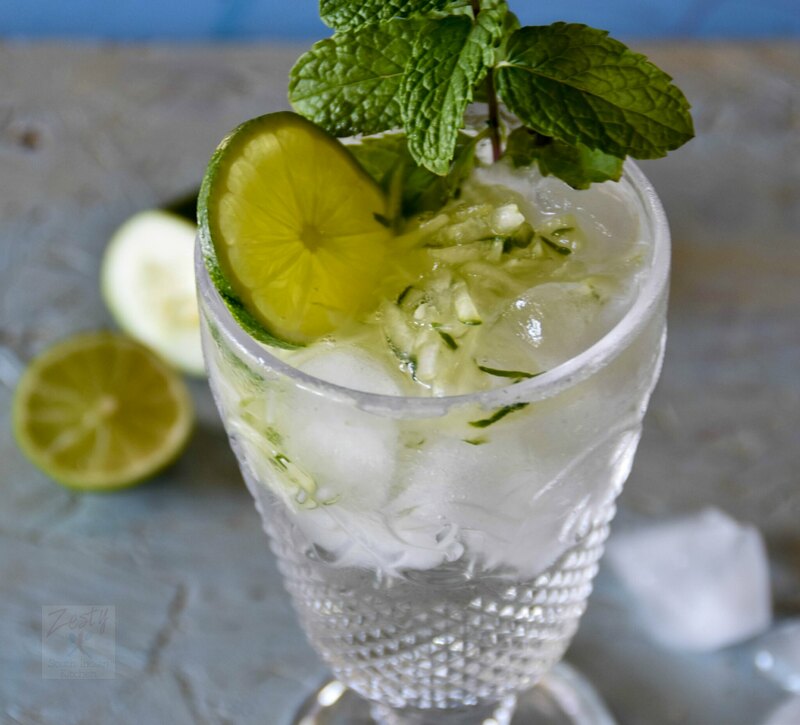 Delicious Refreshing mint and cucumber cooler made with homemade sugar-vinegar and mint syrup. In Kerala (South India) during hot summer days we used to drink lemonade with syrup made of an herb Nannari/Sarasaparilla. So when I came to know about Sekanjabin, which is one of the oldest sweet and sour syrups from Iran, dating back to 10th century, I decided to try it. It’s a combination of vinegar (serkeh) and “angabin,” which refers to honey. Sekanjabin used to make a drink called sharbat-e sekanjabin are usually served during the summer. Sekanjabin is Persian beverage syrup made of vinegar and honey (or sugar) and is an impression more than a specific recipe. In the 10th Century a physician named Ibn Sina (or Avicenna) wrote a Canon of Medicine which listed the medicinal benefits of sekanjabin. When writing his encyclopedia in the 12th Century, royal physician Ismail Al-Jurjani described the types of “sharbat”, or syrups, popular in Persia. In this book he wrote about the beneficial properties that ease indigestion and other “body imbalances”. These same types of syrups are presented again in the Manuscrito Anonimo, an Arabic Cookbook of 13thCentury Andalusia. I also read that, Skanjabin is used as a dipping sauce for crisp lettuce leaves a healthy, refreshing snack that can cool off on a hot day. I came to know about this recipe from a book edible Houston. This recipe is using 2 pound of sugar which is not possible for me to use. Secondly I didn’t know how it going to taste and nobody in the house will drink it every day. So I decided to reduce the serving and made only 5 serving recipe. I also used white wine vinegar and cucumber, the seedless variety. Give a try to this ancient beverage working it wonders even in 21st century. You will love it. Here comes the recipe. 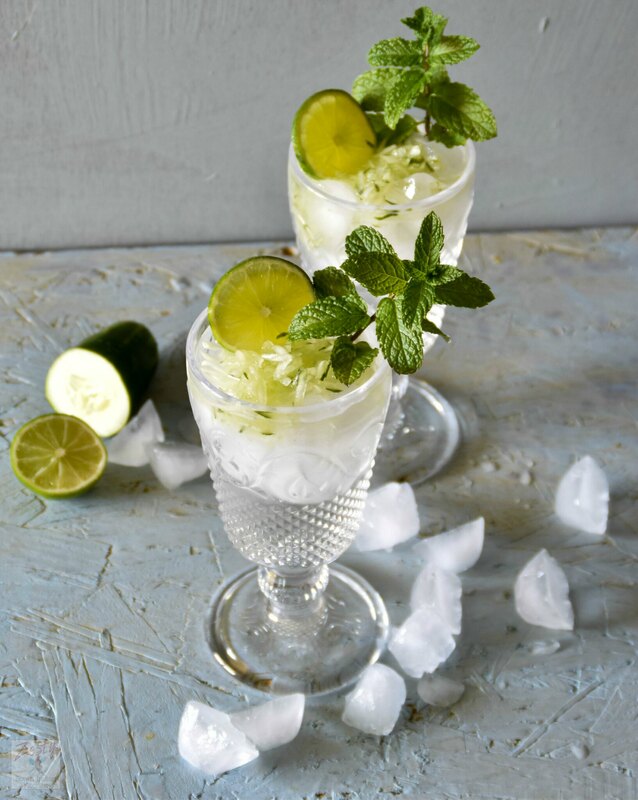 Delicious Mint Vinegar syrup with cucumber ice cubes a refreshing drink for a hot summer day. In a small sauce pot add hot water and sugar and mix sugar and water for 1 minute or until thickened. Add vinegar and continue to mix until the sugar fully dissolved and the mixture starts boils again. For traditional recipe you need to add 1 parts of syrup with 5 parts of water. 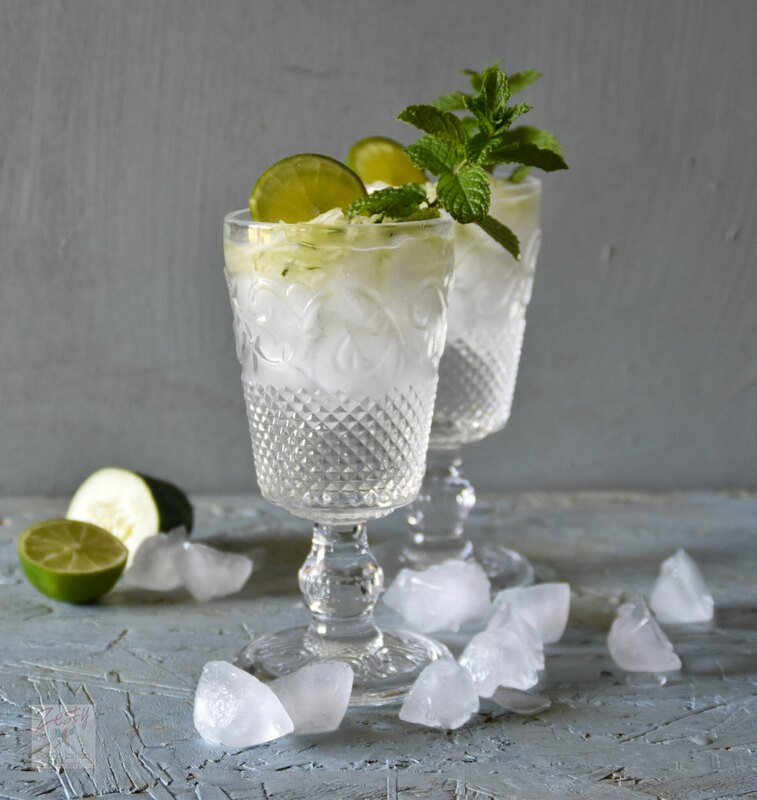 I made one drink like this 2 tablespoon of syrup with ½ cup water and ¼ cup ice and then added grated cucumber and garnish with two slice of lime and mint. Once sugar dissolved add vinegar and continue to boil. If you want to make it adult drink add dash of vodka . This was such an interesting blog post full of information! The drinks sounds so refreshing. I agree, 2 pounds of sugar would be way too much! Looks perfect for the coming summer! Such refreshing drink! 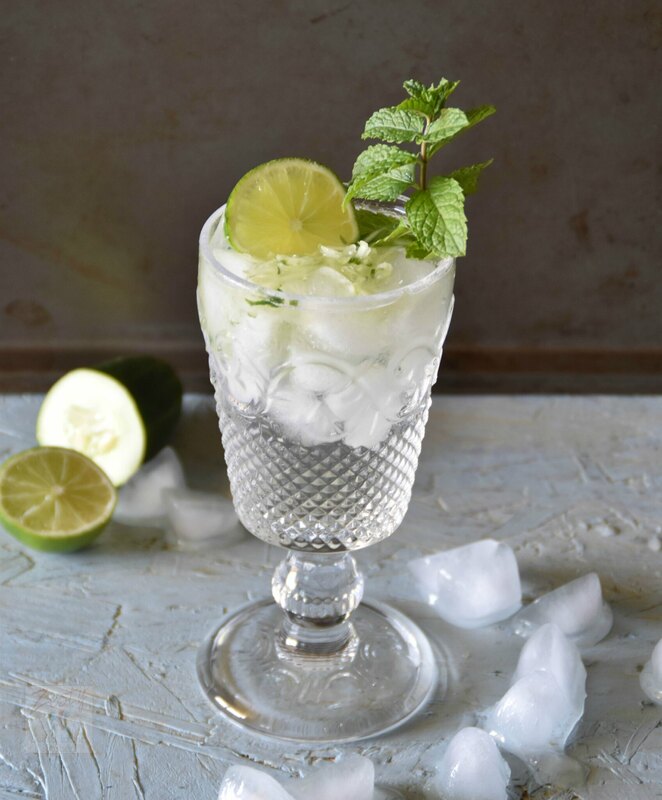 Such a delicious and refreshing drink to cool off during the summer! Love the combination of mint and cucumber. This look like the perfect drink to sip on a patio as the sun sets. I can’t wait for summer! You had me at lime! This looks both delicious and refreshing. I am doing to have to try this as it heats up. Thanks for sharing! Luci’s Morsels | fashion. food. frivolity. Wow! Does this look refreshing and good. Great pictures too, I might add! Hopefully the hot weather will be here soon. Mint is so good as a refresher when it is hot. Great combination of flavours…and your pictures are stunning. This is new for me. I wouldn’t have thought of adding vinegar in a drink and yet it makes total sense!! This looks so summer-perfect! This sounds so refreshing and delicious. A great way to beat the summer heat. I’m in Phoenix, AZ – and we have plenty of heat!! I love reading about the history of this drink – thank you for sharing that interesting info! 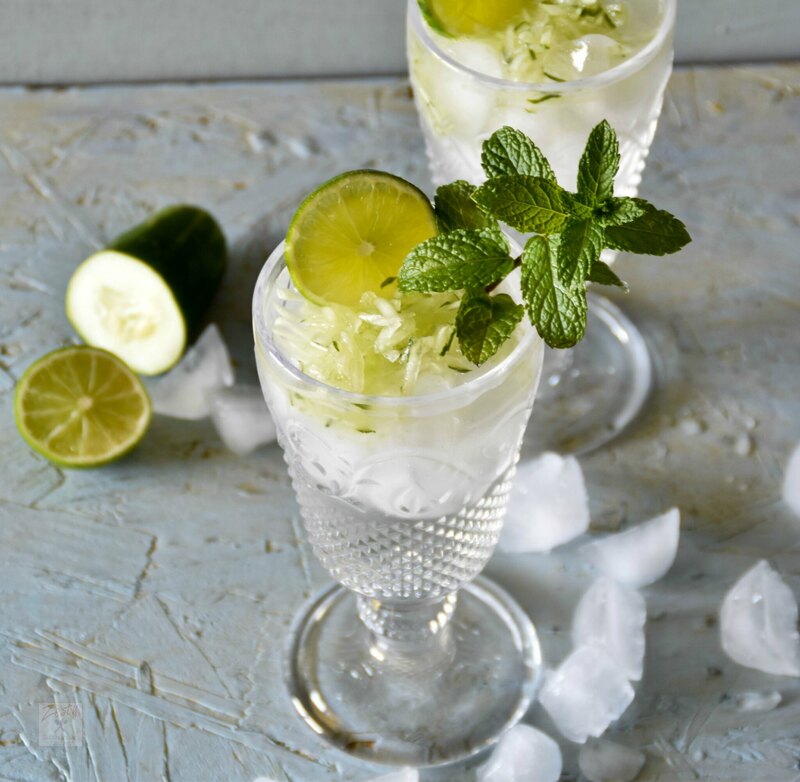 This looks so cool and refreshing, perfect for summer ahead! The photo looks so refreshing. I couldn’t wait to read how to make it. It is perfect for a hot afternoon or evening. Intrigued with using vinegar in a sweet syrup can you replace with lemon or lime juice? The drink looks very refreshing though. This delicious drink makes me thirsty only looking at it. Fantastic recipe and such an interesting read about the history of this syrup. Loved all the information and history about the drink! This is so refreshing and nothing can beat this for summer days. This really is a flavorful way to keep myself hydrated! I enjoy the scent of cucumber things more than the taste. I’ve never tried cucumber and mint together, it sounds like it would be an interesting combination. I’ve been searching for the perfect drink to make for a brunch get together with the girls in 2 weeks. I love how easy this recipe is to make and it just seems fitting to make on a hot summer day in the south! The drink looks so refreshing — the vinegar (acid) I would imagine would help quench thirst. I like the idea of using cucumber in it. We always buy the long seedless cucumbers and we have mint growing outside the kitchen door. This will be such a great drink this summer. stunning presentation swathi!! Love how simple it is and at the same time so gorgeous! it possible to substitute that white wine vinegar?? i really want to try this and i m sure i might not get it here!! !